As automatic enrolment continues to take stride across the UK, with the latest wave of firms with fewer than 30 employees being phased in, there are still many cloudy areas surrounding the regulation. In particular, the circumstances regarding automatic enrolment and directors is one that can be confusing. In this article we cover some of the frequent questions surrounding automatic enrolment for directors that you have been asking. 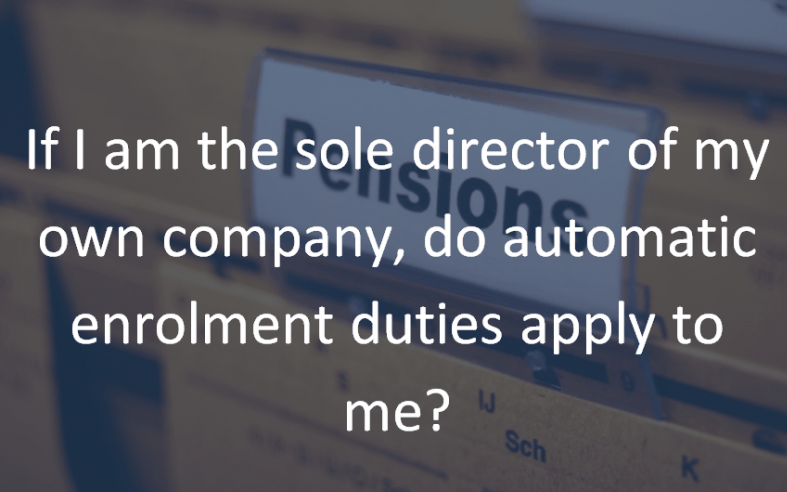 If I am the sole director of my own company, do automatic enrolment duties apply to me? This is certainly a question which has been raised before. Directors of a company are classified as office holders, meaning they are usually not considered as workers for automatic enrolment purposes. If you are the sole director and you have no other staff working for you, then the company is not considered for automatic enrolment purposes. In this case, the company will not be considered as an employer. If I am a director within my own company and the other people working at the company are directors, do automatic enrolment duties apply to me? If I am a director within my own company and the other directors do not have contracts of employment, but two other workers do, do automatic employment duties apply to me? As with the answer above, directors are not usually considered as workers for automatic enrolment purposes. However, if a director and any other worker at the company has a contract of employment with that company, then the director is a worker and is therefore classified as a worker for automatic enrolment purposes. In this case, they may need to be automatically enrolled. Running through a few examples may make this clearer. Company A has 5 directors and none of them have a contract of employment. In this example, the company does not have automatic enrolment duties. Company B has 5 directors and one of them has a contract of employment. In this example, the company does not have automatic enrolment duties. Company C has 5 directors and two or more have contracts of employment within the company. In this example, the company does have automatic enrolment duties to the directors who have contracts of employment. Company D has 2 directors, who neither have contracts of employment, and one member of staff, who has a contract of employment within the company. In this example, the company does have automatic enrolment duties to the member of staff. Company E has 2 directors and one of them has a contract of employment, and one member of staff, who also has a contract of employment within the company. In this example, the company does have automatic enrolment duties to the member of staff and the director who has a contract of employment. Company F has 2 directors, who neither have contracts of employment, and two members of staff, who both have contracts of employment within the company. In this example, the company does have automatic enrolment duties to the two members of staff. Company G has 3 directors and none of them have a contract of employment. At this stage, the company does not have automatic enrolment duties. The company then employs a new director, who is given a contract of employment. At this stage, the company still does not have automatic enrolment duties. The company then employs a member of staff, who is also given a contract of employment. Here, at this stage, the company now does have automatic enrolment duties to the member of staff and the director who has a contract of employment. As you can see, the duties of directors can be quite confusing in regards to automatic enrolment, particularly if circumstances change over time. If you do not apply for automatic enrolment duties you must write to The Pensions Regulator or submit a notification informing the regulator online. The process of submitting an online notification is easier than sending a written letter and you will receive a confirmation email much quicker. You will also not have to complete the Declaration of Compliance if you do not apply for automatic enrolment duties. If your circumstances change, as shown in the example with company G, then you must write to The Pensions Regulator and inform them as soon as possible. Penalties may be levied on those who are seen to mislead or provide false information to avoid automatic enrolment duties. For more help with automatic enrolment please contact us or register for one of our free Auto Enrolment Workshops. Nigel Smith is responsible for the Wealth Management company within Hawsons, providing Independent Financial Advice to individual and corporate clients. For more details and advice, please contact Nigel on [email protected]uk or 0114 266 7141.